This was my fourth cruise on Sedream and my wife and i went to celebrate my 65 th birthday and her 60th birthday. 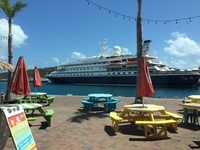 We went for two weeks and the first week there were only 45 passengers on board as we were originating in St Thomas and visiting Jost Van Dyke and St Barts on our way to Barbados. The dinner to celebrate my birthday on the back of the boat was serviced with every detail and our cabin decorated when we returned! Silvio was always welcoming and made us feel at home and was always there to ne sure our service was excellent. Anna the Activities Director and Taylor the Club Director were always fun to be with and the second week Taylor took us to Happy Island for Rum Punch one afternoon which was a unique experience, the good part of Seadream is we always get to know and enjoy all the staff and crew making it such an enjoyable experience! The second week we caught up with people we met on our last Seadream cruise Sandy and Ross from Australia and met a great couple from Switzerland that we had dinner with Saturday night in Bridgetown after disembarking, Needless to say , we love Seadream! This was my fourth cruise on Sedream and my wife and i went to celebrate my 65 th birthday and her 60th birthday. 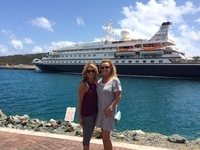 We went for two weeks and the first week there were only 45 passengers on board as we were originating in St Thomas and visiting Jost Van Dyke and St Barts on our way to Barbados. The dinner to celebrate my birthday on the back of the boat was serviced with every detail and our cabin decorated when we returned! Silvio was always welcoming and made us feel at home and was always there to ne sure our service was excellent. Anna the Activities Director and Taylor the Club Director were always fun to be with and the second week Taylor took us to Happy Island for Rum Punch one afternoon which was a unique experience, the good part of Seadream is we always get to know and enjoy all the staff and crew making it such an enjoyable experience! Needless to say , we love Seadream! The cabin is adequate for the time we actually spend in it! The view from our dinner table. Sunset off the coast of Hvar.